The nutritional and medicinal value of metals, such as zinc, calcium, and iron, has been known in traditional medicine for a long time. Other metals, such as silver and gold, may also have therapeutic and health benefits. Ancient medicines have long incorporated their use in the treatment of diseases, and they have also more recently been explored for treatment in allopathic medicine, birthing the concept of metallonutraceuticals. The challenge of using metals in the human body is to find forms that are safe and effective. 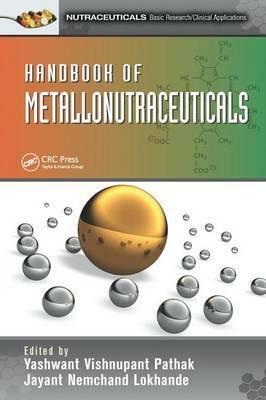 Handbook of Metallonutraceuticals presents basic concepts related to the nutritional and therapeutic use of metals, product development strategies, and some ideas ready to be applied for condition-specific metallonutraceuticals. The book begins with an overview of the nutraceuticals field and the need for metallonutraceuticals. It considers the roles of various metals in metabolism, reviews the ethnopharmacology and ethnomedicine of metals, and covers the characterization and possible properties of metallonutraceuticals. It also examines bioavailability and drug interactions, and therapeutic applications of nanometals including use as imaging agents, in cancer diagnosis and treatment, as antibacterials and antivirals, in ocular disease, and in neurodegenerative diseases. The book explores the use of metals in traditional Chinese medicine, potential applications for metalloenzymes, the use of nanosilver in nutraceuticals, and the potential of gold nanoparticles as a drug delivery system. In addition, it addresses intellectual property rights and regulatory considerations regarding metallonutraceuticals. Using an interdisciplinary approach, this user-friendly text provides a knowledge base and inspiration for new research in this exciting field.